Easy-to-reach button controls make it a breeze to answer calls, change song, adjust volume. Chat and listen longer with enough power for hours of continuous calls or music. Simply plug the headset into a USB port to recharge. Enhanced Superior Sound : Proprietary 40mm large-aperture drivers provide clear, vibrant sound with boosted bass.Soft Memory-Protein Cushions provides comfortable fit and passive noise isolation that provides you a crisp, natural, and immersive Hi-Fi sound experience with CSR chip. You can indulges in your music world. Light Weight and Comfortable Design: With light weight 174g (6.13oz), the On ear headphones is suitable for business people and travelers who don't want to be tethered to their devices. The adjustable, soft ear cushions and flexible headband ensure the headphones fit securely and fit snguly but comfortably. Wireless and Wired Playback: Bluetooth 4.2 ensure more smooth, stable connection with your sound source for hours of wireless listening up to 10 meters of listening range and is widely compatible with most Bluetooth-enabled devices, both Android and iOS. You aslo can keep the music playing by plugged in 3.5mm Audio Cable when the batteries are ready to run out. Long Battery Life: Built-in a Li-Ion rechargeable battery guarantees seamless enjoyment of music for up to12 hours playtime with a quick charge of 2 hours.Includes an iOS battery indicator so you know the Bluetooth earbuds' remaining battery life. The headphone battery status will be automatically displayed on the IOS and Android Phone screen. 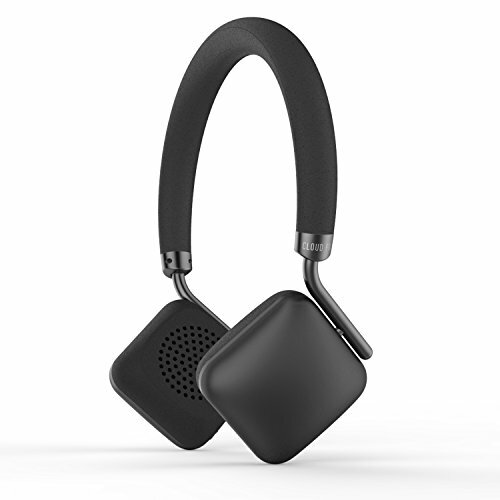 Built-in MIC and Warranty: Built-in microphone offers a hands-free call by short press "pause/play"buttons on the headphones. We do provide 12 month warranty. Gentle reminder: please take off the headphone every 1-2 hrs to get your ears relax and keep the head comfortable. If you have any questions about this product by Cloud Fox, contact us by completing and submitting the form below. If you are looking for a specif part number, please include it with your message.